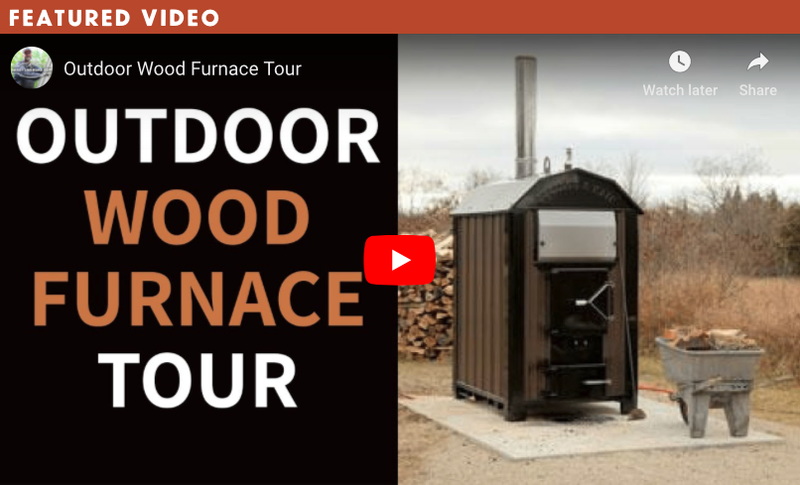 Updated 6Apr2019: Lately I’ve been getting a steady stream of questions about the outdoor wood furnace we use at our place for space heating and domestic hot water, so here’s an article that explains how it works. As energy prices trend upwards, more and more people are looking to wood as a sustainable, affordable source of heat. Wood heat makes sense for any able-bodied person living near trees, and while firewood can be burned in a freestanding stove, a masonry heater or a basement furnace, outdoor wood furnaces are a little-known option that’s worth looking at. Just before Christmas 2011, I fired up an outdoor wood furnace I installed at my own place, and it addresses the kind of energy issues that more and more people are concerned about. Living through my 9th winter with an outdoor wood furnace, I really like this technology. This article is an introduction to how it all works, with links to related content. Outdoor wood furnaces are made by a handful of companies and all models look like a small metal garden shed with a short chimney. Feed wood into the firebox behind a door on one end, and the fire heats water in an insulated tank that’s also inside the structure. Pipe this hot water to buildings through insulated underground pipes, extract the heat, then use it for space heating and to heat domestic hot water. This is the outdoor wood furnace proposition in a nutshell, and it offers unique advantages. By moving the fire outside, you sidestep the work of bringing firewood indoors, the potential hazards of burning it there, and the work of hauling ash back out. Canada and the US are at the leading edge of outdoor wood furnace technology, and as I’ve discovered for myself, this heating option offers a range of benefits. Need some help learning to stack firewood? Click here to learn more about how we stack wood in round piles at our place. You’ll definitely want to see this. Outdoor wood furnaces make wood cutting and splitting more efficient, because the work can happen right next to the place where the wood will be burned. The best setups include a wood storage shelter near the furnace, creating an all-weather location to keep wood as dry as possible over winter. Some users even have their wood splitter permanently parked in the shelter. Splitting and stacking happens all in one place, minimizing the chore of handling wood. The fireboxes on most wood boilers are larger than you’ll find on even the largest indoor woodstoves, and this is a big advantage. The smallest outdoor wood furnaces can accommodate wood 20 inches long, but many larger boilers burn wood twice that long. The Portage and Main BL-3444 I’m using now is a case in point. It can take pieces of wood up to 40″ long. Bigger wood makes for much less cutting time and more efficient use of your wood splitter. The bigger your wood, the less time it takes to prepare it. Massive heat output is another unique feature of outdoor wood boilers, and this offers another efficiency. Even the smallest models are capable of heating a full-size home. Larger units capable of heating multiple buildings as well as heating domestic water, all from a single location. The work of tending one centrally located fire that’s outdoors is safer and easier than maintaining two or three fires inside several buildings. If you want to heat your whole realm with wood, you can’t do better than an outdoor wood furnace. Life with my outdoor furnace is great, in part because of the design of the unit I chose to buy. I’ve owned two boilers over the last 9 years, both made by a Canadian company called Portage and Main. 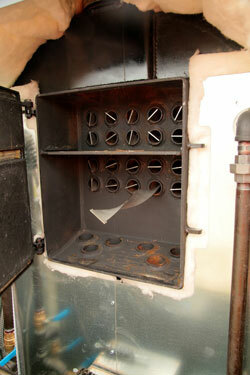 The first one I bought was what they call a “gasification” boiler – the Optimizer 250. Instead of letting smoke waft upwards and out through the chimney, combustion gases are directed downwards, through the burning coals and into a secondary chamber. Here they burn with a roar that looks and sounds like a large, blue natural gas flame. The result is performance that’s clean enough to meet EPA Phase 2 standards for wood burning appliances, some of the toughest in all of North America. Click here to watch a detailed video tour of this model. Three years ago my Optimizer 250 developed a water leak because of an engineering issue that has since been corrected, and Portage and Main offered me any boiler they make as a replacement. I opted to try a non-gasification model that was made to burn either wood or coal. The BL-3444 I’ve been running for a few years now has advantages and disadvantages. On balance, I like it a lot. The non-gasification BL-3444 is easier to maintain and keep clean, and it does a better job burning wood that’s not completely dry. The shaker grate on my BL-3444 also allows me to burn coal instead of wood. I’ve burned several tons of anthracite coal in this outdoor “wood” furnace and it burns long and smokelessly on each filling. On the downside, the BL-3444 does produce somewhat more smoke than the Optimizer 250 did when burning wood, and it probably burns a little more wood, too. All things considered, as much as I liked my 250, I like the BL-3444 a little more. 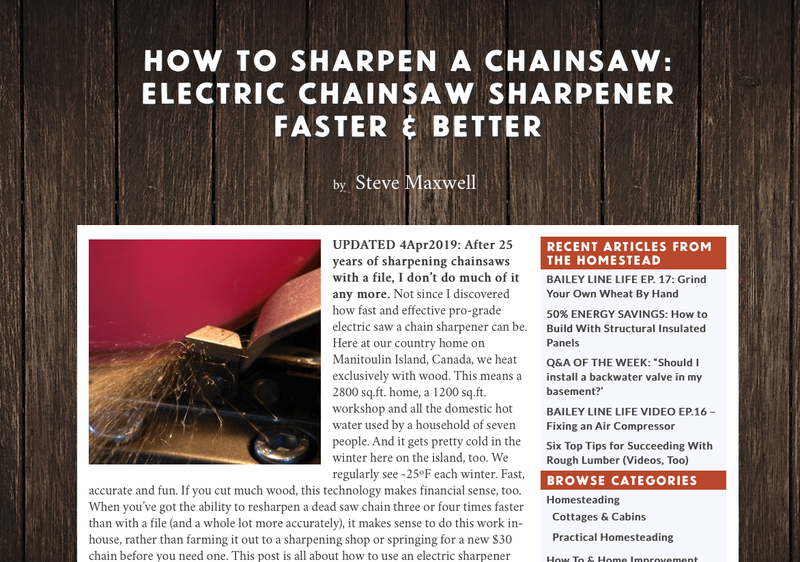 Need help keeping your chainsaw sharp? I love electric saw chain sharpeners and have been using two models for more than ten years. 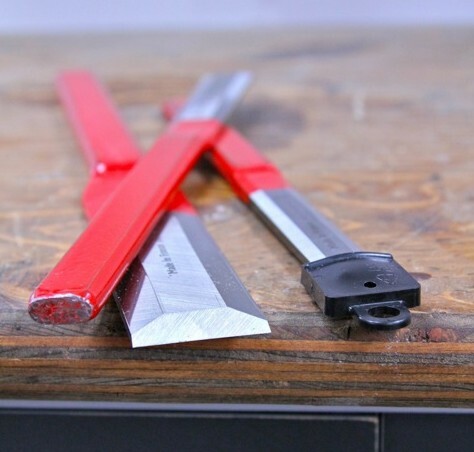 Click here for a detailed tutorial on using an electric sharpener, but be warned. You won’t want to go back to a file after you’ve try one of these things. 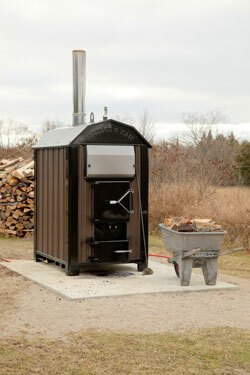 Outdoor wood furnaces aren’t for everyone, but they do have a growing place in the rural and semi-rural heating scenes. They make direct use of an energy resource that’s abundant and renewable across much of the world, and the fact that it’s likely to stay that way may be the best benefit of all. E80-Based Building Codes: Will They Make Homes More Energy Efficient? Tankless Water Heaters – Are They Right for You?